In 1986 Joe Satriani opened up a whole new world in the music industry with his first guitar instrumental album Not Of This Earth. In 1987 Surfing With The Alien made the melodic guitar sound familiar to even more people. Joe's example is still alive and kickin' with a great number of guitar heroes like Paul Gilbert (ex-MR. BIG, RACER-X), John Petrucci (DREAM THEATER), Marty Friedman (ex-MEGADETH, CACOPHONY) and more; who released their own instrumental albums. Gary Schutt is best known as touring bass player/guitarist for Jeff Scott Soto (ex-Yngwie Malmsteen, TALISMAN, JOURNEY) and with his new album Loss 4 Words, is entering the instrumental guitar players list. Gary's talents on guitar and writing, guitar based, instrumental tunes is printed on this album. Gary plays all the instruments on Loss 4 Words and took care the cover art as well, we can safely say that this is an one-man album, except that Gary is been blessed with some extraordinary guest musicians, such as Neal Schon (JOURNEY), Oz Fox (STRYPER), Bryan Beller (DETHKLOK), Howie Simon (Jeff Scott Soto, ALCATRAZZ) and Jeff Thal (BUMBLEFOOT). 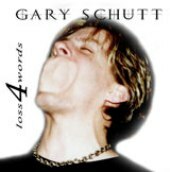 Loss 4 Words is based on the musical talent of Gary Schutt, with the lead guitar sound obviously in the front of the mix along with a lot of keyboard and synth sounds in the background. Many of the drum parts are coming from a MIDI sequencer that makes the final result a little bit out of feel. The melodies that Gary uses in Loss 4 Words remind me of Satriani's compositions, despite the fact that Joe's technique is unreachable and hard to copy, but manages to capture this guitar mood.For Example the songs like Always & Forever and Loss 4 Words are variations of Satriani's Always With Me, Always With You, the same feel and major scale with the same background sound. Loss 4 Words also includes a DVD with some unreleased and alternative version of the audio CD songs along with the music video of Baby Dinosaur. Gary Schutt obviously wants to make himself a part the G3 line-up and with Loss 4 Words he seems to be in a good track. As for myself I will stick to the original Satriani work, for now.